Strengthen the weak point in your 2011-2014 Ford Mustang Shelby GT500 rear suspension with this all new Upper Control Arm Mount. This mount is specifically made for the 11+ Mustang which was re-engineered by Ford with new suspension geometry. Complete bolt in installation that replaces the flimsy factory upper mount. This new unit will eliminate any flex, which means more power to the ground. Made from 1/4" thick steel (more than twice the thickness of stock) and Tig Welded in a Billet Fixture for a perfect fit every time. Installs in 1-1.5 hours or less with factory hardware. 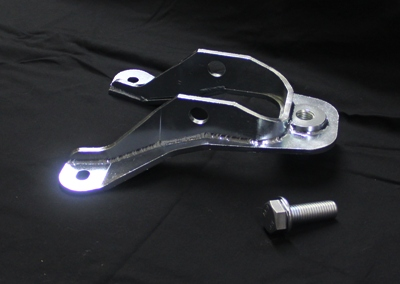 18mm top bolt is included for those upgrading a *2005-2010 Mustang. 2011 2012 2013 2014 Mustang 5.0L Coyote Boss 302 4V GT V6 GT500 Shelby Steeda Saleen and Roush Vehicles. *2005 2006 2007 2008 2009 2010 Mustang 4.6 5.4 4V 3V V8 GT GT500 Shelby Steeda Saleen and Roush Vehicles. *Will fit these years if you switch to a 2011 or newer specific upper control arm. If you have a UPR adjustable upper control arm you can also upgrade to the 18mm hardware in order to use this mount. No one else can stack up to the bold clean styling of our aftermarket Billet dress ups, Street Strip & Racing Suspension & Performance Parts for your late model American Muscle Car!